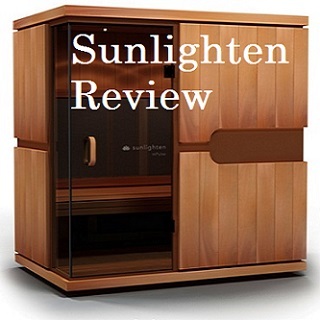 Jacuzzi Clearlight Infrared Saunas Review - Are They Really the Best? Jacuzzi Clearlight Infrared Saunas Review – Are They Really the Best? Clearlight Review – Clearly the Best by Design? 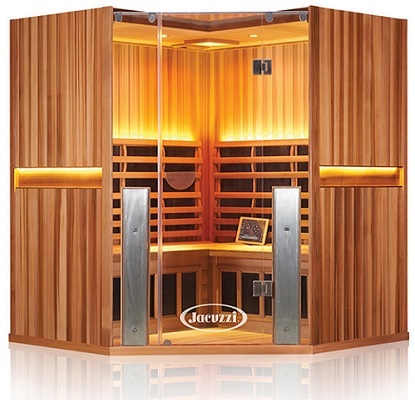 You have likely heard that Jacuzzi® Clearlight Saunas are the best far infrared saunas on the market. Why do so many doctors and wellness clinics such as Hippocrates Health Institute and Whitaker Wellness Center use and endorse Clearlight? And is it the right choice for you? Jacuzzi® Clearlight Infrared Sauna is our top rated brand 2018. This recommendation is based on 6 years of research which includes use of several brands and discussions with many company owners and manufacturers. Our hope is that our research will save you a lot of time and help you make the best decision for you and your family. Unfortunately, this industry has a lot of misinformation and many brands look nearly the same. We want to help you understand what is different between brands so you can choose the best one for your family. The company was started 22 years ago by Dr. Raleigh Duncan and is still owned by him. It is a true innovator and the pioneer of low and no EMF heaters. Clean Western Canadian Cedar in the Premier Model with optional basswood and Western Red Canadian Cedar Sanctuary Line with lots of features. Innovators of Carbon Ceramic Blended panels. 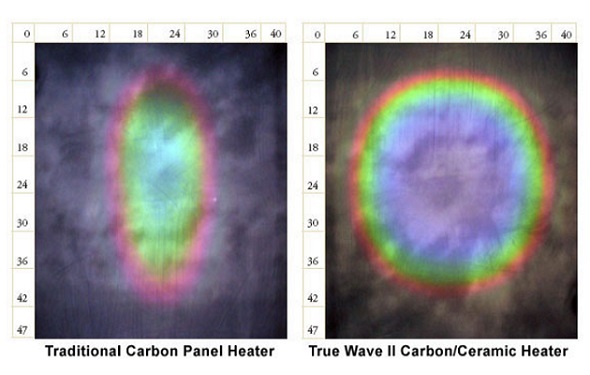 Their True Wave II low EMF heaters have the best detoxifying infrared penetration of any carbon panels. The best in the industry. A true full lifetime warranty on everything including wiring and sound system. Note: This is the brand we have at our home. When you understand the significant differences between companies, a Clearlight sauna is a very easy decision to make. We did not receive any discount when we bought our Clearlight sauna. I purchased it after months of research and discussions with several people in the medical field. This entire website began as a result of that initial research. What Makes Clearlight Infrared Saunas So Different? Are These True Low EMF Heaters? Is This the Best Warranty in the Industry? Does Jacuzzi® Have a Clearlight Outdoor Sauna? Does Jacuzzi Clearlight Make an ADA-Compliant Wheelchair Sauna? 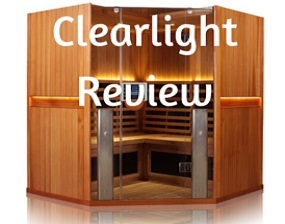 Clearlight Sauna Reviews – What do they Reveal? Are There Many Clearlight Sauna Complaints? It is important to understand that 95% of all saunas are massed produced on 4 Chinese assembly lines. Anyone can form an LLC and begin re-selling these as a “re-seller.” Some companies add a few features such as flux magnets or lights to try to differentiate themselves. In contrast, this company has been an innovator. It is very noticeable that its carbon panels extend only about halfway up the sides of the interior, stopping about at the shoulder level. This is mainly due to the powerful panels used. Jacuzzi® did not purchase Clearlight saunas. Jacuzzi® was looking for a brand to partner with and in May 2017, Jacuzzi® formed a partnership with Clearlight. After 2 1/2 years of due diligence, Jacuzzi® selected this brand due to its powerful, effective True Wave II heaters, reputation and technology to produce the needed volume. There was no purchase and Sauna Works continues to manufacture the units. The company has been owned by Dr. Raleigh Duncan for 22 years. The fact that Jacuzzi® chose this brand to partner with reinforces the top rating we have had on this brand for the past 5 years. And it should give you a tremendous amount of confidence in purchasing this brand as well. 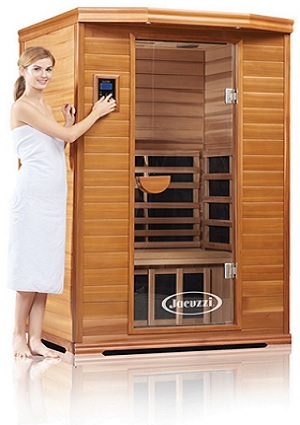 The only real or tangible is difference is a Clearlight sauna now has the brand name of Jacuzzi® sauna visible. 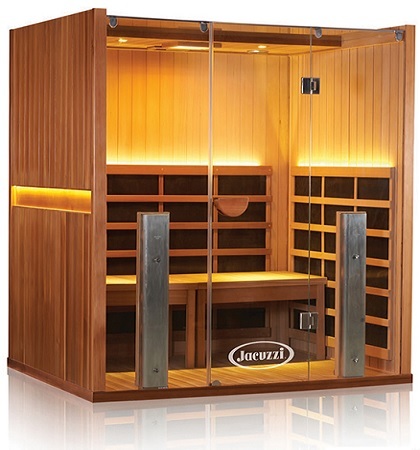 A Jacuzzi® sauna is a Clearlight sauna and all the quality that has been part of that brand for over 2 decades. The result has been an expanded market for this existing brand. And there is now a Clearlight Jacuzzi® infrared sauna in addition to the well known hot tubs. Bob Rowan, CEO for Jacuzzi® Group Worldwide has stated it fits with their focus on well-being. It has been called a game-changing partnership. Tell them Cody the SaunaGuy suggested them and mention getting the “Healing Heat” pricing. My readers get special pricing as they know you are educated. Their panels are actually a unique combination of beneficial Carbon with Ceramic fibers woven into the carbon. The ceramic provides stronger, focused heat. This provides the user with a faster warm up time and better infrared penetration. As well, your head is protected from direct heat. Almost all other carbon heated units have carbon panels extending nearly up to the ceiling at the back and on the sides. This is done to compensate for the low output carbon that is used by inferior brands. Many panels are weak carbon or even sprayed on carbon which offers little to no infrared benefits at all. The wood is air dried and construction uses no toxic glues or chemicals. Heating up and deep breathing toxic chemicals in a confined space is prevalent with some cheaper units and should be avoided. The assembly of the pre-wired units requires no tools. Assembly takes about 1 hour for 2 people and instructions are provided. Heater Location. Heaters are located on the back and side walls but also behind the legs, on the sides of the legs and importantly in the front. This provides infrared to the entire body. Many companies omit some of these. Floor Heaters. Some of their models have heating elements in the floor. There are 20,000 pores in the bottom of the feet and it is beneficial to heat the feet and lower legs as well. This also keeps the body’s temperature even throughout, benefiting blood flow and detoxification. Only 2 others in the industry offer floor heating. Full Spectrum. In the Sanctuary product line, two powerful near infrared heaters are added which supply 800 watts of near infrared. These Clearlight True Spectrum heaters provide 20x the power of the nearest competitor, a very well known brand, which adds 4 small 10 watt LED bulbs. 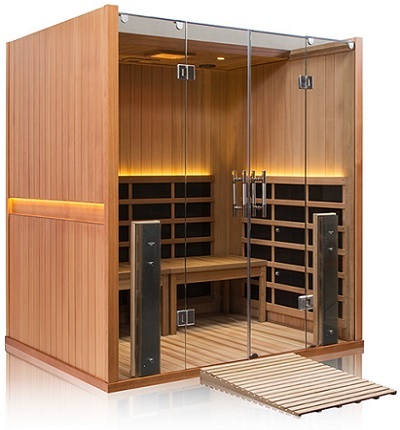 Your sauna session will benefit from a full spectrum of heaters covering the far, near and mid infrared wavelengths. The high end Sanctuary C product is displayed below. This is a critical area of concern if you are truly concerned about your long term health. EMF (Electro Magnetic Fields) not only surrounds us daily from all forms of electronic devices, but EMF can be dangerous and harmful to long term health if exposed at high levels. 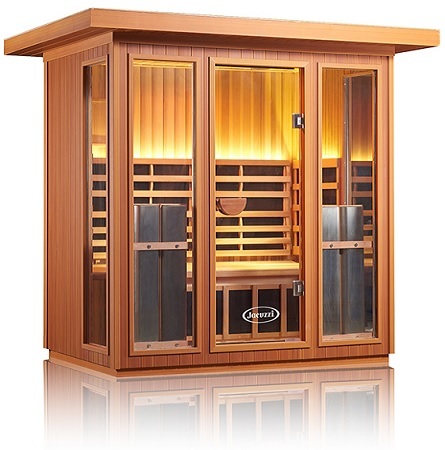 Sauna Works, the company that produces Clearlight infrared saunas, was the first to pioneer and offer a truly low to no-emf infrared experience. It continues to lower its EMF and remains the industry standard for the lowest levels. It’s current models are near zero EMFs. It was first to reduce the extremely low frequency ELF as well. While many companies claim low EMF levels, this company backs its claim with independent test results. We applaud them for posting third party independent results on their website. We have posted those readings below as well. Thankfully, during the past decade many companies have lowered some of the dangerous EMF levels of their products. However, some others have EMF ratings of 10-30 mG and at least one has levels over 170 mG.
Keeping the emf levels below 3.0 Milligauss (mG) is considered a safe level for extended sessions. 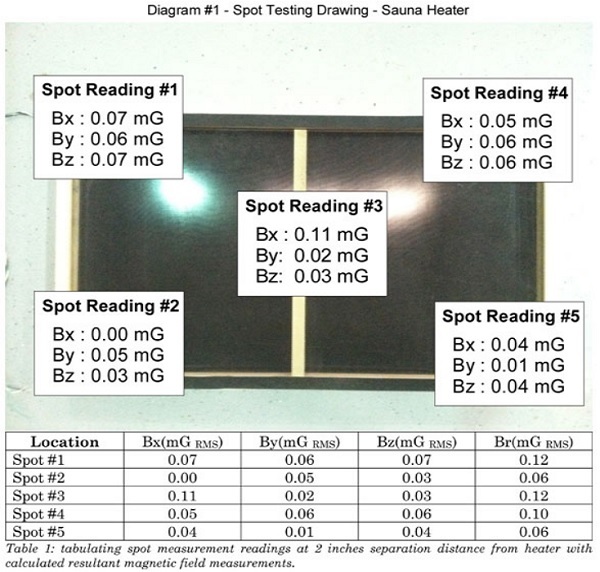 Currently Clearlight saunas are nearly zero EMF with ratings of 0.05 mG. When you compare the stated EMF outputs of various models, it is very important to know where the readings were taken. Readings are highest near the heater elements. The above readings were taken 2″ from the heater surface. As an example, one popular brand informed me they had readings of “only 10” (which is high) but the readings were taken in the center of the sauna. Additional research revealed that readings near the heating element were actually over 30 mG, which is dangerous. They offer the best warranty in the industry. Their products carry a full lifetime warranty on all components. This includes wiring, radios, wood, True Wave II heaters – everything. They call it their “everything but the bulbs” coverage. This is backed up by their 22 year history. If you ever need parts, service or help with shipping information, the company will be there to help. We have heard many reports of customers receiving excellent after-sale service. In this industry, half of the companies go out of business within a few years. You want to buy from a company that will be around to actually back up their warranty. There are 3 easy to understand models. Each line displays exceptional craftsmanship and includes the full lifetime warranty, chromotherapy lights, True Wave II Low EMF heaters, interior and exterior control panels, roof ventilation and more. The Premier line uses tongue and groove construction with Eco Certified Canadian Western Red Cedar. The Clearlight Premier IS-2 is the company’s top selling model and for good reason. It includes recessed LED lights, Bluetooth, AUX and MP3 audio inputs and speakers, ability to preset an auto power on and more. It has substainlly more room than the 1-person Premier IS-1 with a small price increase. The Premier IS-3 is also a popular choice. In our opinion, either of those or even the IS-5 has more floor space for occupants’ feet than the IS-C corner model. The Premier is now also available with Basswood instead of Cedar. The Basswood option has all the features of the Premier, but at a lower price point and basically replaced the Essential Line, which was phased out. The Clearlight Sanctuary Line adds powerful Clearlight True Spectrum near infrared heaters providing full spectrum infrared that is 20x more than the closest competitor. Models range from the 1-person Sanctuary 1 up to 5-person Sanctuary 5 units and include device charging, audio station, smartphone remote control and reservation mode. 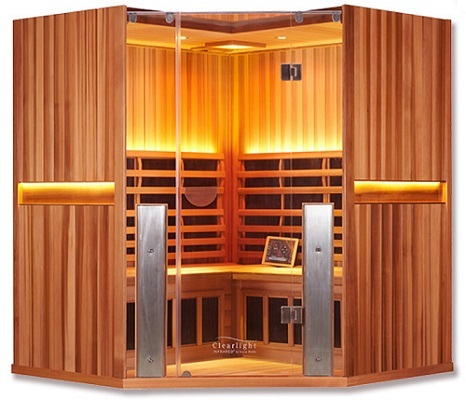 The Clearlight Sanctuary 3 is one of the most beautiful full spectrum infrared saunas offered by perhaps any brand. One model in the Sanctuary line, the Sanctuary-Y is a Yoga Hot Room. The benches are removable and a fitted yoga mat can be laid down for a hot yoga room experience. The Sanctuary-C is a beautiful corner unit designed with much more floor space than the Premier-C. The Clearlight Curve Dome is a portable dome unit with solid wood, memory foam infrared pad and organic hemp covering. Note: The Essential Line was replaced with a basswood version of the Premier during the 2017 partnership with Jacuzzi®. The Essential had been made from Clean Nordic Spruce and included the floor heater under a ceramic tile. The popular Essential CE-2 and CE-3 provided all of the “Essential” elements for a detoxifying infrared therapy experience without some of the features of the higher end models. “Yes, in 2018, Jacuzzi® Clearlight added a 5 person outdoor sauna. The Sanctuary Outdoor-5 has been tested and offered in a limited capacity for the past 2 years. It is a Clearlight Sanctuary Full Spectrum Model that has been designed for outdoor use. We discuss its engineering. It is a 4-5 person Sanctuary Full Spectrum wavelength unit that uses Eco-certified Cedar offering low-emf, chromothrapy, accent lights and a reservation mode. It is built with engineered wood on the outside which is real wood, double pane glass, wall insulation and a weather resistant large roof. The Outdoor 5 has overpowered heaters with 4 True Wave Full Spectrum front heaters offering all wavelengths, with 2000 watts of heat to keep the cabin hot in cold weather. The floor is an easy cleaning tile with heaters in the floor. This new offering has been designed with technology in mind, including a very nice feature provides you to remotely control the heaters remotely via a smartphone/tablet app. No need to run out in the cold to power up the cabin. “Yes. The Clearlight Sanctuary Retreat is a 4 person ADA-Compliant Full Spectrum Infrared sauna. It is designed to be wheel chair accessible by adding features that include center opening doors, ramp, lower inside control panel and other features to a Sanctuary Y Yoga model. Our detailed review discusses the features. Want to upgrade your existing sauna? You can purchase custom True Wave II heater kits for your existing unit. Andy Kaps, co-owner, has informed me you can contact Clearlight and they will work with your contractor to design a large custom sauna room to your exact specifications. 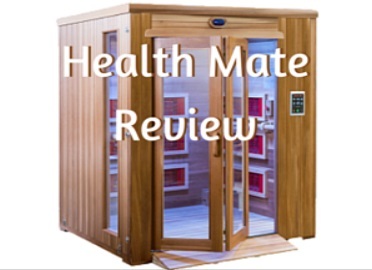 The many Jacuzzi® Clearlight sauna reviews that are available show that consumers and medical leaders alike are exceptionally pleased with this company. Very notable doctors and clinics such as Dr. Whitaker of the Whitaker Wellness Clinic and Dr. Clement of the Hippocrates Institute endorse and use Clearlight Saunas with their patients. Please note that when you read a Clearlight sauna review, you are reading a Jacuzzi® sauna review. 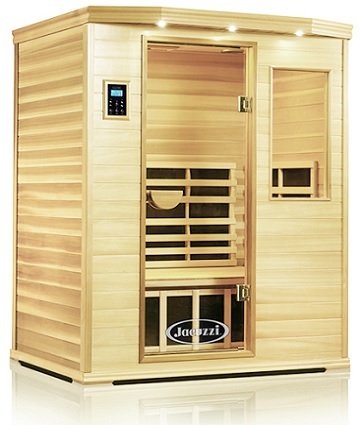 The Jacuzzi® infrared sauna brand name on the glass is essentially the only change after the partnership between the two brands. Other nutrition and longevity-aware industry leaders also use this brand in their own homes. In fact the owner of the #1 worldwide health related blog owns two in his home. He has stated that the infrared heat from the True Wave II heaters produces a sweat that contains a lot of toxins. A sweat that removes toxins is what can help heal the body. It was after this careful study and discussions with many of these true experts and reading their reviews, that I purchased a Clearlight infrared sauna for our personal use in our home. We have been exceptionally pleased with it. I interviewed several experts including a case manager at Whitaker Wellness Clinic, a representative at Hippocrates Health Institute and the top prolotherapy doctor in the US. Without exception they recommended this brand. You will never be disappointed with a Clearlight infrared sauna. You won’t find many Clearlight Sauna complaints online. Every company will have some but this company has avoided the many complaints that are typical for the industry by innovating, taking care of customers and offering their unrivaled warranty. Half of the models can be plugged into an normal 15 amp socket without requiring additional wiring. The larger models require a 20 amp socket. The units are first assembled at the factory, run for 8 hours and then disassembled and shipped. Dr. Raleigh Duncan, a chiropractor, founded Sauna Works, the maker of the Clearlight infrared saunas 20 years ago. Sauna Works is now co-owned with Andy Kaps. This brand continues to be used in clinical studies and wellness clinics. 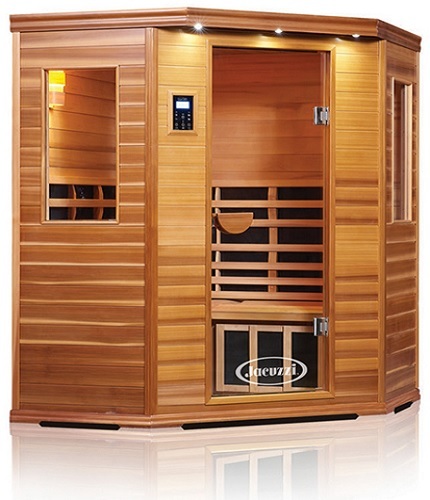 Infrared saunas are one of the best purchases a person can make to improve their health. A healing heat therapy session will provide a host of health benefits infrared offers including cardiovascular improvements, improved skin condition, internal metabolic detox, heavy metals detox, ability to heal joint pain, weight loss and improved sleep. We encourage you to read our reviews page which provides ratings and comparisons of the various brands. 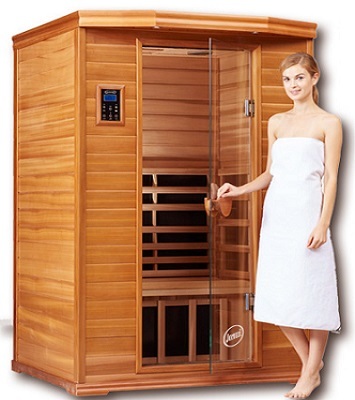 It also lists our top recommendations, including Clearlight Infrared Saunas. To receive a Jacuzzi® Clearlight infrared sauna prices list covering all models and the most up to date price list, contact them here. Mention the “Healing Heat” pricing and tell them Cody the SaunaGuy sent you. They like my readers as you are already educated when you call them.